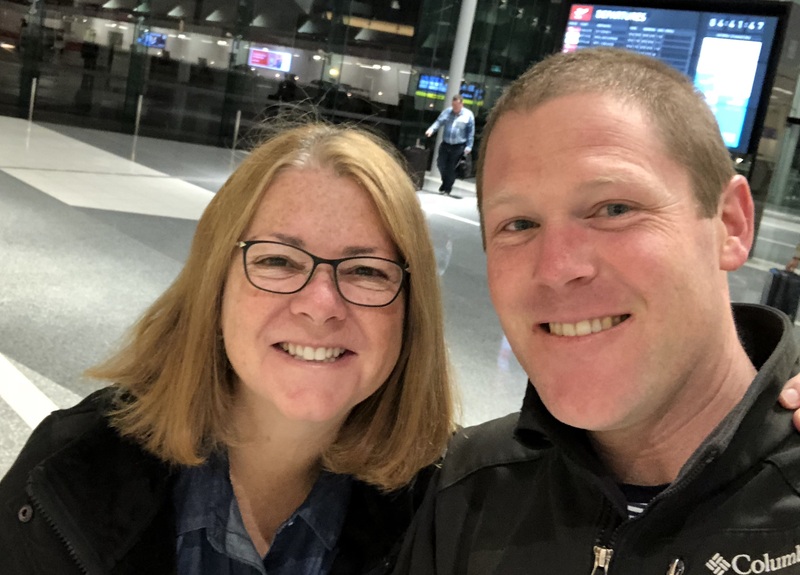 Marist communities, parishes and movements were blessed to welcome Lisa Hendey to Australia for a two week speaking tour in Sydney and Canberra throughout August. Lisa is an international speaker, author of 13 books, and founded the website CatholicMom.com which has over 100 bloggers writing about family, faith, and ministry with young people in the US. The speaking tour was an initiative of Mr. Matthew Hutchison, Principal of Marist College Canberra and part of the 50th Jubilee celebrations for the College. Mr. Hutchison said, “it was important to provide an opportunity to celebrate and deepen our faith through this Jubilee year, which honors the deep spiritual heritage inherited from the Marist Brothers”. Following in the footsteps of the early Marists in Canberra, Mr. Hutchison was keen to share the ‘gift of Lisa Hendey’ as broadly as possible and extended the invitation to all Catholic Principals, Catholic Education office staff, families, and parishioners. Over the fortnight, Lisa spoke to hundreds of parents, teachers and students across Sydney and Canberra. Facilitating sessions with Junior School classes, parents, Religious Education teachers and Catholic Principals and leaders. A highlight of the week in Canberra was the Mothers’ Retreat and offered an opportunity for like-minded women to come together in a safe friendly environment to reinvigorate their own individual spiritual paths. Lisa led with openness, love and compassion. Anne Hartwell said, “I was blessed to be able to attend the parent evening, mother’s retreat and the Sisterhood event where Lisa spoke. Lisa shared her faith in Jesus in a real and accessible way. She is a creative and generous person and very genuine in the way she reminded and revealed to us the incredible gift of our faith in God. Life is too busy – Lisa’s profound wisdom to families is to reclaim Sunday Mass as the focus and most important highlight of our week. Lisa brought to life the Pope’s call for all of us to become holy – right where we are – to become saints for the kingdom. Thank you for the wisdom and generosity of Matthew to bring Lisa to our community and for all of your hard work Nathan. The blessings of her visit will continue to flow. Having Lisa here was so encouraging – an injection of hope, peace and joy! It is wonderful knowing that we have a dear friend in her journeying with us in faith, hope and love”. Lisa paid tribute to the example of St Mary of the Cross MacKillop as a woman of strength and resolve in times of adversity and change. The Marist RE staff enjoyed the opportunity to discuss, share and respond to the prayer with Lisa. It was insightful and refreshing which in turn allowed growth of their own spirituality. Teachers noted Lisa’s spiritual maturity and were grateful for the many ways she presented to bring dynamic prayer to the boys. They also said, “it was a truly amazing experience to listen to Lisa’s insights on faith and how each of us can live holy lives as parents, educators, students and families in the modern world of busyness, social media and the everyday challenges of life”. The art of storytelling was a common thread of Lisa’s presentations as she encouraged participants to write their own stories and become Missionary Disciples, sharing the great story of Jesus’s love in their homes, classrooms and parishes. Students at Marist, Saint Francis Xavier College and Girls Grammar also had the chance to spend time with Lisa through the week. Students at Marist commented, “Lisa came to visit our class and we learnt that we are being saints by helping the environment, being kind and helpful. By being kind and helpful we are being good role models to other people. We found it inspiring the way Mrs. Hendy urged us to live our lives. She told us we are all called to be saints and that made us think we should really strive to live our best lives. Mrs. Hendy really connected with us; she didn’t just give us information. She had a positive attitude and a good sense of humour”. Lisa offered practical advice to parents and principals on how to manage the sacred balancing act of deepening the spirituality of young people whilst caring for their own spiritual needs. This included the importance of role modeling, teaching the skills of conversation, engaging with parish and providing accompaniment to families. Lisa explained that families are not after an app or a book, rather, they want to connect and the school is both a place for evangelization and a wonderful bridge between the domestic church and the Parish community. Daniel Ang, Director of the Office for Evangelisation in the Diocese of Broken Bay said, “it was a delight to welcome Lisa for a day with their families, Lisa shared tremendous encouragement as well as practical tips for women, families and married couples to not only sustain their engagement with the life of the Church but also deepen it. Lisa was able to speak into the lives of the sixty participants and affirmed the holy significance of the everyday and the domestic church, the sacred ground on which the mission of our Church depends. We were so grateful to have Lisa with us during her visit to Australia and we thank the Marist community for their generosity in sharing her gifts with us”. In between sightseeing on the North shores of Sydney and petting kangaroos, Lisa also visited Parousia Media and conducted interviews with Catholic Weekly. A highlight for Lisa was joining Marist Association members for the Feast of the Assumption Mass at St Patricks at the Rocks. Lisa met Marist families and members of the Marist Association and delivered a presentation on the Sacred Balancing Act. This has been Lisa’s first visit to Australia and it has been a wonderful experience for her particularly for the very warm welcome she has received from everybody. Lisa Hendey offered the following reflection on her time in Australia, “the words "grateful" and "blessed" don't begin to describe the feelings in my heart as I return home from my first-ever journey to Australia. While I came to your country to serve, I departed you filled with an awesome sense of the Universal Church in her wholeness. Especially at a time when our Church in the United States is undergoing such a time of difficulty, the Missionary Disciples I encountered in Australia left me inspired, uplifted and anxious to find new ways to continue our international dialogue on the role of every person of faith at this time in our Church's history. From the Year Four students who reminded me that we are each called to be a "saint-in-the-making" to the great-grandmother who reminded me to claim my role as a servant leader, every person I met along my path has become part of a beautiful quilt of spiritual memories that wrapped me in such a warm and loving welcome. I am anxious to see how the seeds that were sewn by so many who participated in my events during my visit will continue to blossom and flourish in your communities. I want to thank in a special way the entire family at Marist College Canberra, especially headmaster Matthew Hutchison and Director of Faith Formation Nathan Ahearne, for your warm hospitality and the glowing example of "fiat" in today's world”. We are so grateful for the wisdom, energy and faith that Lisa brought to each of her encounters and wish her all the best as she continues in her ministry which is reaching thousands of people each day. Nathan Ahearne's faith journey has helped to shape the person he is today as husband, father, teacher, and formator of young people. His vocation and faith are strengthened and nourished by those he encounters in service and contemplation. Nathan is a creative thinker and likes to roll up his sleeves and see projects through to completion. He is a John 10:10 fan. Read more at Expressions of Interest.